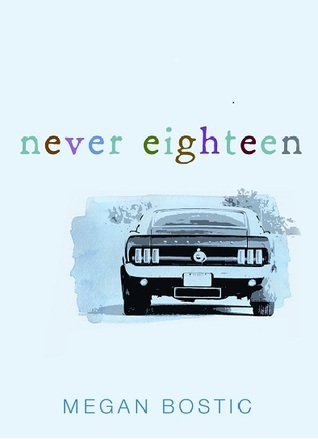 Please welcome Megan Bostic, the author of Never Eighteen, to Alison Can Read! 1. REM in the late 80’s at the Pantages Theater in Seattle. This one was awesome. It was before they were huge and it was a pretty small venue. We even saw Peter Buck walking down the sidewalk before the show. 2. The Police, 1982, Ghost in the Machine tour. This was my first concert. I was twelve. Huey Lewis and the News opened for them, which was weird. I was at the very front nothing but a barrier between me and Sting. I had the hugest bruise on my hip the next day from being crammed up against the barrier. It was worth it though. 3. The Monkees, this year. I’ve seen the Monkeys three times, but the best by far was the one I just went to a couple months ago. My sister and I bought VIP tickets. We were second row, center stage. They sound the same as they always have and played old videos in the background. Afterward we got to meet them and get our pictures taken at a reception. 4. Joe Jackson, Paramount Theater, Seattle, 1989. This was probably one of the most amazing concerts I’ve ever seen. Very small venue, and it just felt personal, like he was singing just for me. 5. Maroon 5 with One Republic, last summer. I had no idea One Republic was opening for Maroon 5 so it was a big surprise. These are two of my favorite new bands. 6. Madonna with Beastie Boys, Paramount Theater, Seattle, 1985. This show kicked off Madonna’s debut concert tour. Poor Beastie Boys. I loved them, but they were getting boo’d. I mean, was it really a good idea to pair these brand spanking new rappers (they were more than likely teenagers, License to Ill would not release for another year) with the Material Girl? 7. Lenny Kravitz, Fox Theater, Portland, Oregon, 1991. This venue was tiny, and Lenny ROCKED!! His opening act did too, can’t remember her name. His then wife, Lisa Bonet, was lingering in the shadows. 8. Police, Fixx, and Thompson Twins, Tacoma Dome. Now, everything I’ve read says this was 1983, but to me it seemed late. Won’t argue with the net though. Ultimate 80’s concert. I should mention I’ve seen The Police in concert about, hmmm, four or five times, and Sting 3 outside of that. They were my favorite band for a long time. 9. Pearl Jam. Free concert, 1992, don’t remember which park it was at, but it was awesome. 10. Now, for one concert I would LOVE to see but haven’t yet, probably one of my favorite artists of all time . . . Eminem. I love him. I’d like to go on a date with him. Not sure he’d have me though. 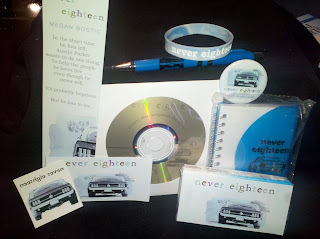 Win an awesome Never Eighteen SWAG pack: Bookmark, sticker, bracelet, notebook, pen, temporary tattoo, a button, pack of tissues and a CD of songs that inspired the novel. -Alison Can Read is not responsible for items lost or damaged in shipping. Best concert- By far this September when I saw Arctic Monkeys my very favorite band. We traveled to Dallas to see them. I managed to get in the front of the stage on the front row and then afterwards I actually got to meet Alex Turner. Such a stupid fan girl moment..but I behaved myself =0) I am also dying to read this book, it sounds so wonderful! The best concert I've ever been to is Coldplay. The stage had a beautiful backdrop, blow-up balloons (huge ones) went out to the audience, and close to me Coldplay band themselves moved away from the main stage for a little while and played acoustically. It was a mad experience. I'll definitely come back for another concert with them. I haven't been to any concert sadly. But, I would really love to attend One Direction concert! They are my favourite boy band now!!! Thank you for the giveaway! I went to a HIM concert in high school, my only concert, and it was a blast. I managed to push my way to the front, so I was only a few feet away from the band. I was exhausted the next day--it was a school night, but I didn't mind. I haven't been to many concerts. Oddly enough, the most entertaining concert I went to was Ozfest 2001, its not at all my kind of music but my husband loves it! I thought Marilyn Manson put on a very entertaining and theatrical performance. I was impressed! I LOVE Eminem and would love to see him in person. *Swoon* He definitely has that unrepentant bad boy thing that can be so very appealing! Thanks for the giveaway! I've been really looking forward to reading this! The best concert I've been to was KISS! Wow! Incredible showmanship and crowd interaction. The show rocked. Don't enter me, but those are all great bands that I would love to see. I also found the Beastie Boys and Madonna tour to be very weird. I would love to see either artists alone, but together? I don't know. My favorite concert was U2's Love Tour tour in 1989. I saw them in Adelaide, South Australia as an exchange student. My host sister and I got up in the dark to to ride the train into town to stand in line to buy the tickets (lots of "to's", huh?). I was hoarse for two days after lots of concert screaming. My host dad found this hilarious. Awesome. This book sounds really interesting. Concert? I don't think I've ever been to one, unless you count free stuff, like in parks or at street fairs. If I could attend only one concert, it would probably be a Boys Like Girls one. BUT, I would also love to watch Glee and StarKid. OMG! I'm so jealous! Wicked list of concerts you've attended. The best I've been to was when '96 when Goo Goo Dolls and No Doubt opened for BUSH! I was so in love with Gavin Rossdale at the time so I fought my way to the front of the mosh pit and stayed there all night despite suffering a head injury. It was totally worth it too, because Gavin spit water on to the crowd and some landed on me!!! True Story. I was surprised with concert tickets to see Aerosmith in concert many, many years ago. It was a great concert by itself, but what made it incredible was that it was the first concert that I ever went to and it was a gift from someone who meant a lot to me at the time. Any one of the 7 Backstreet Boys concerts I went to with my daughter. She tells me it makes me the 'worlds best mum', so it was worth every noisy minute. The best concert that I had ever attended was also the first concert that I had ever been to, which is probably a main reason why it has such a dear place in my heart. I went to Bearstock two years ago with my sister and her friends, and the main acts were Cartel, The Maine, and We the Kings (one of my favorite bands to EVER). The concert was amazing. We were all jumping and clapping and singing along to the songs, and it was just plain awesome. Anyway, thanks for having such an awesome contest! I'd love to win! please enter me. the best concert i've been to was lupe fiasco. I have never been to a concert, but I would lvoe to go to a Papa Roach concert. I absolutely love them! I haven't been to any concernts since I moved to the States (sad, I know), but I went to plenty of them when I lived in Puerto Rico. The absolutely best concert that I've ever been to was last September when I went to see Adam Lambert in concert. He was freaking amazing just like I knew he would be and it was one hell of a show. It truly was the absolute best night of my life. I am also a huge fan of Eminem so I would LOVE to go to one of his! Haven't really been on anyway so ye, if I could choose it would be Eminem! I haven't been on any concert but if I would have a chance I would want to attend the Script, I really love their songs. ;p and paramore. I have been to many concerts but they are Greek artists. I'd love to see Linkin Park and Red Hot Chili Peppers. The best I have been to is The Corrs. They involve the crowd and sound just like they do on thier albums. My best concert is between one from Juanes and one from Enrique Iglesias. Both were amazing and I couldn't stop dancing and singing! I'd love to attend a Taecyon concert! ACDC - BEST concert ever. Old rock never dies it, just gets better. GLEEEEE! Sorry, I'm a huge Gleek. Well, it was the BEST.CONCERT.EVER. I loved it. Plus, they shot T-shirts into the crowd. I didn't catch one, but it was still a good time. i havent been to a concert. I love Big Time Rush. I hope I can see them someday, it will be a dream come true if I do get to see them. I would die to go to their concert. Wow, this one sounds absolutely heartbreaking. In a good way, though. Favorite concert...oh man, I am a BIG concert fan, so it'd be hard to chose a favorite. I loved seeing Bon Jovi in their home state of NJ because there's just a different energy when you come home to the place you came from. Josh Groban is always awesome and I love that he allows himself to geek out a bit during his concerts. The Beach Boys, Boyz II Men, and Trans Siberian Orchestra all stick out as fun times. But I guess if I had to pick my all-time fav, it would be Lady Gaga this past April. Holy hell does that woman know how to put on a show!!! Thanks for the giveaway op! The best concert I've gone to was the Camp Rock 2 concert from their tour last year. It was such an amazing experience seeing the Jonas Brothers and Demi Lovato live. Demi is an amazing singer. She has so much talent. The Jobros were cool too, especially Nick. I will always remember that day. :D Thanks for the giveaway! PARAMORE!! This was my first (and so far only) concert which I've attended. I was pretty close to the stage (in the standing pit) but due to my small height, I was squished around a lot. It was painful but AWESOME. thanks for makign this international!! bst concert! AEROSMITH. last year in october, i went with my best friend and we have such a good time...we were very close to the stage so we see everything!! i really hope that i win this, the prize and blog are Awesome!! Thank you so much for the chance to win this amazing swag and book..! Best Concert has to be paramore and you me at six, it is the most recent concert i've been to. even though it was almost 2 years ago i still remembr every detail.